Sweat dripping down smiling faces, the old and the young standing side by side, chatting. One woman flips her hair, bobs her head back and closes her eyes – an expression of deep satisfaction spreads over her face. The noise level is high, but the happiness is greater – if only for a short while. People have gathered, as if at a train station, inside a bank, any random bank. The air conditioner is blowing, the cool air tickles the woman’s face, she lets out a sigh. There is a name for this in Korean, and it’s called 은행피서. In the sweltering Korean summer heat, humidity at its highest, Koreans know what to do: find the nearest bank and take five minutes to cool down before braving the sultry heat again. Despite the temporary respite, Koreans will still feel worn down at the end of a stifling hot day. Enter Samgyetang, the hot Korean ginseng chicken soup that will warm you up from inside and give you the inner strength you need to remain lively and energized. With the hot days already upon us and summer in sight, I too start craving samgyetang (삼계탕). Against all common sense, the hot and filling samgyetang is a popular dish during the sweltering hot summer days on the Korean peninsula. Ice cream – yes! Cold juice – of course! But piping hot soup with chicken and rice? The reasoning behind why this is a good choice is not inherently apparent. But reasons there are plenty. The basic principle and scientific wisdom that lies behind the dish is the belief that in order to reinvigorate the body one should treat heat with heat. Or using the language of the four elements, one should “fight fire with fire” (이열 치열, 以熱 治熱). According to oriental medicinal theory, in the summer days blood circulates near the skin to cool the body. This results in poor blood circulation in our internal organs, which translates to internal organs remaining cold. The effects of this can be poor appetite and exhaustion. But fear not, there’s a solution to this, and it’s called samgyetang. Eating nutritious hot dishes such as samgyetang can increase the blood circulation in the internal organs and help restore energy and appetite. And not only this, but through sweating after eating the hot soup, our body heat can be lowered as well. Starting to feel convinced that samgyetang is a suitable summer dish? Samgyetang is not just considered a warm dish because the soup is served hot. According to the Encyclopedia of Oriental Medicine (Dongui Bogam – 동의보감), it has a range of healthy, warm ingredients which are good for the body. Ginseng, a well-known medicinal herb, provides nutrients, speeds up metabolism of the body, and helps restore energy. The spicy and warm garlic helps blood circulation and also detoxifies and sterilizes the body. Jujubes (red dates) neutralize poisons and strengthen the digestive system, again to help blood circulation, and also to help organs function. And then of course there’s the chicken, which warms the pancreas and stomach and strengthens the five major organs (heart, kidney, liver, lungs, and spleen). Amongst all the warmth, a cold ingredient has sneaked in as well – to provide balance and synergy. It’s the glutinous rice inside the chicken that must seem for the unknowing consumer like a treasure unexpectedly encountered. It too, strengthens the digestive system and provides energy during the hot and humid summer days. More specifically, during the three hottest days of the year, the three bok days, or sambok in Korean, restaurants specializing in other dishes will set up signs on the roads advertising their samgyetang menu addition. Koreans worn down by the heat will flock to these samgyetang-offering restaurants, motivated by tradition, but magically drawn in by the sounds and smells of the bustling eateries. The concept of sambok 삼복 is one introduced to Korea from China. Bok refers to a day when the yin energy plunges before the soaring yang energy. It includes Chobok 초복 (literally ‘beginning’ bok day), which falls on the 10th day of the sixth month of the lunar calendar. It also includes Jungbok 중복 (‘middle’ bok day), the 20th day of the lunar calendar’s sixth month. And Malbok 말복 (‘last’ bok day), the 10th day of the seventh month. They fall between June, July and August, and this year they are on 17th July, 27th July and 16th August respectively. The history of samgyetang goes back to Korea’s days of food scarcity, in particular of meat. Cows were precious commodities that needed to work on the fields rather than be eaten. The same would go for pigs, so smaller animals were the ones to provide the protein and calories needed by hard-working individuals, especially during the excretory Korean summer. Amongst duck, eel, and dog, chicken was one of them. 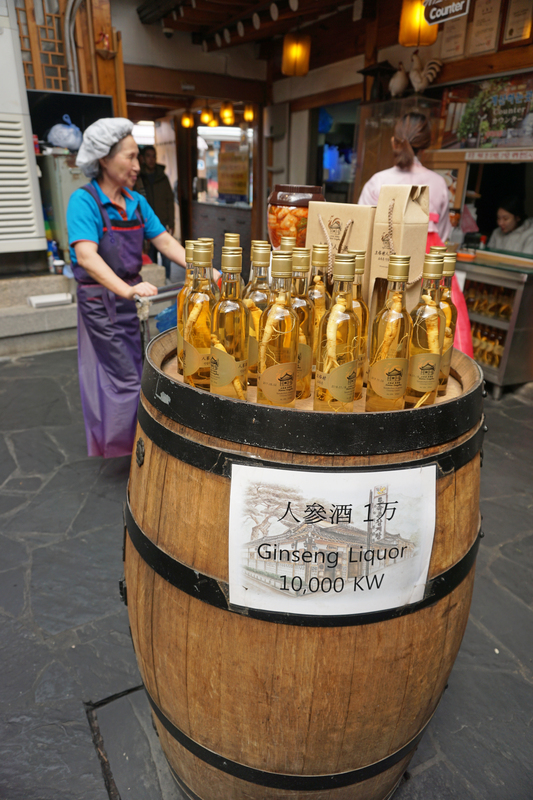 But because it was traditionally considered less nutritious than seafood, beef, and pork,ginseng and other herbs were brewed in to give it a nutritious kick. Once ginseng was made more widely available, there was no stopping the spread and popularity of samgyetang. It became so celebrated that mother-in-laws would even kill one of their backyard hens and prepare samgyetang to welcome their son-in-law into the house. The classic mother-in-law’s homemade samgyetang still remains popular, but many fusion versions with unorthodox ingredients such as chestnuts, pine nuts, and a range of different seafood have also become popular. 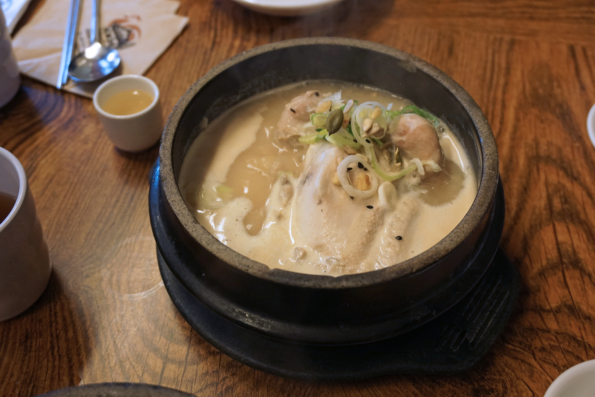 The classic samgyetang version is cooked with a whole young chicken, which is about three to six months old and hasn’t yet laid any eggs. It’s still very tender and small enough to fit into a bowl. The cavity of the whole spring chicken is stuffed with ginseng, jujubes, garlic, ginger, hedysarum root, and glutinous rice that is infused with the chicken and other flavours. The chicken’s legs are tied together to prevent the stuffing from falling out, and the chicken is boiled in an earthenware bowl or stone pot for about an hour to make the broth thick and rich, and the meat so tender that the flesh falls off the bone with just one tug. In many restaurants it is served piping-hot in a stone dolsot bowl with a complimentary shot glass of ginseng wine, which can be drunk straight or poured into the soup to strengthen the ginseng taste. Tosokchon Samgyetang 토속촌삼계탕 near Gyeongbuk Palace in Seoul is one of those restaurants that serves samgyetang in that way. The family business has been in existence since 1983 and has been using ingredients with Korean origin only since its opening day. 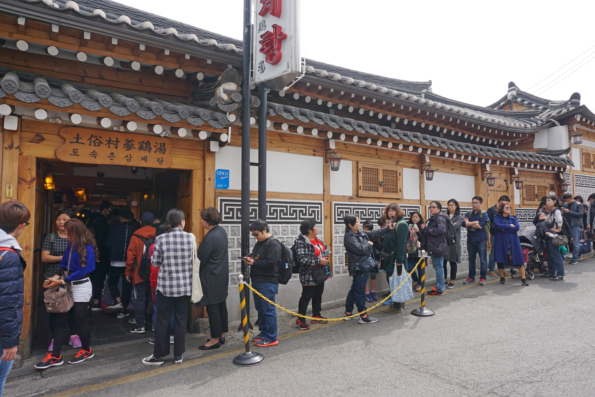 You are likely to see queues forming during lunchtime, but don’t despair, the Hanok-style restaurant has a seating capacity of about 400, so the wait shouldn’t be too long. The seating style is traditional, with wooden floors and old-school wooden tables. The restaurant offers both Korean-style on-floor seating and Western-style at tables with chairs. The menu offers various chicken dishes as well as Haemul Pajeon (seafood pancake), but we just went for what they’re famous for: the classic Tosokchon Samgyetang and the black version of it – Tosokchon Ogolgye Samgyetang. The restaurant’s samgyetang does not only include ginseng, garlic, glutinous rice, and jujube, but also pumpkin seeds, black sesame, walnut, pine, native chestnut, sunflower seeds, and gingko – a real flavour feast! The black version is a silky fowl with black-toned flesh, skin, and bones. It is a rare chicken that has been handed down as a healthy bird for the food of royal families, which the public wasn’t able to taste in the past. Silky fowl has – you guessed it – additional health benefits such as clearing the blood and promoting erythropoiesis in the bone marrow. The silky fowl may be an instagram-worthy chicken due to its colour, but if flavour and texture are more important to you, I recommend you stick to the classic of the classics. The Tosokchon Samgyetang is much more tender and juicier than the Ogolgye Samgyetang option, and a more affordable option as well – despite being more delicious! But oftentimes the more affordable foods are the most delicious and gratifying ones. Korea has the kind of food culture that has a special food for every occasion. Whether it’s makgeolli (rice wine) and jeon (pancake) during rainy days, jjajangmyeon (black sauce noodles) on Black Day (when singles get together to mourn their singleness), or samgyetang on the three hottest days of the year. Watch this space for more articles on the traditions of Korean food culture.